University of al-Qarawiyyin in Fez, Morocco. Over 1000 years ago, amongst a migrant community in the western districts of Morocco, the vision and investment of one woman paved the way for the founding of the world’s first university: the University of al-Qarawiyyin in Fez, Morocco. Fatima al-Fihri, who was born in Tunisia, hailed from a well-educated family. Not much is known about her early life, but sometime in the early 9th century, Fatima migrated with her father and sister from Qayrawan in Tunisia to Fez in Morocco. Upon the death of her father, Fatima inherited a large fortune. She invested this wealth in founding a mosque and educational institution for the benefit of her local community. 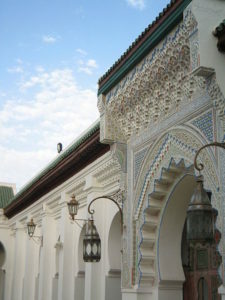 Gradually, the establishment blossomed into the University of al-Qarawiyyin, named after Fatima’s birthplace – Qayrawan – in Tunisia. Established in the year 859, the University of al-Qarawiyyin was the first degree-granting educational institute in the world (as recognised by UNESCO and Guinness World Records). Students from all over the world travelled to study a wide range of subjects, ranging from natural sciences to languages to astronomy, and Fatima herself studied there too. During the medieval times, the University was considered a major intellectual centre. Unsurprisingly, numerous notable scholars have studied at this stellar institution. Rumour has it that even Gerbert of Aurillac – better known as Pope Sylvester II – studied at al-Qarawiyyin, and it is he who is given the credit of introducing Arabic numerals (that we use to this day) to the rest of Europe. The University of al-Qarawiyyin is still in operation today, and amid its other attractions, houses one of the world’s oldest libraries. The library contains over 4000 manuscripts, including the famous historian Ibn Khaldun’s 14th-century text Muqaddimah. The library recently underwent refurbishment, pioneered by female architect Aziza Chaouni, who worked to renovate the library and give it a face-lift. Fatima’s foresight and commitment, alongside her selfless contribution towards championing intellectual advancement, led to the establishment of a monumental university. The remarkable legacy of her dedication and empowering endeavour is well-deserved and one that is a source of inspiration for all. The library of al-Qarawiyyin is now open to the public and, amongst other treasures, exhibits Fatima al-Fihri’s original diploma – on a wooden board! To celebrate Women’s History Month we have 50% off the titles listed here.